Index IQ has come out with a "hedge fund for the masses." This one is called the IQ Merger Arbitrage ETF (exchange traded fund), and it is destined to confuse and potentially (accidentally?) harm investors. I'd bet money that they'll be required to change the fund name. And how cute is the stock symbol? MNA -->> M-N-A, pronounced "emm-en-ay," like M&A or Mergers &Acquisitions. I'm going to explain this as briefly as possible, as I know some readers are experienced stock market types and some aren't. Merger arbitrage is a strategy of buying the stock of the company being acquired while simultaneously shorting the stock of the acquirer, in equal dollar amounts (if the deal is an all-stock exchange). The whole point is to isolate your risk. You're betting on the deal closing, and you hedge away market risk, because in an all-stock exchange of shares, as one stock rises so does the other. What you're betting on is that the deal closes and the "premium" goes to zero. By premium I mean the difference in the price offered and the current trading price of the company being acquired. There usually is a discount, due to risk of the deal falling apart. Talented merger arbitrage portfolio mangers have to manage these risks and decide what risk is acceptable. The strategy used to be exclusive to expensive hedge funds, but now companies are trying to offer these products to regular investors. There have been mutual funds employing this strategy for some time, but this is the first I've heard of an ETF doing it. (ETF's attempting to be the "low-cost" fund option. 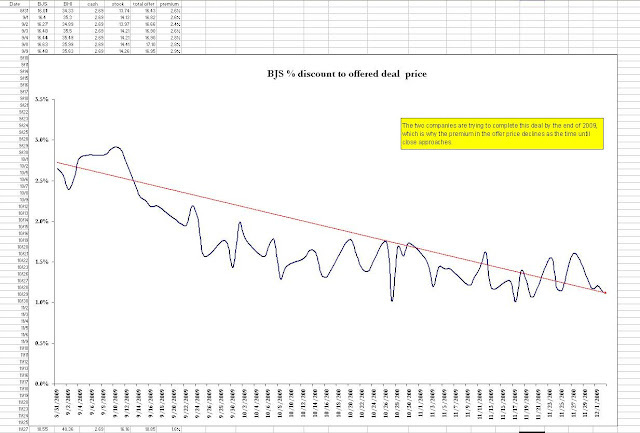 Below is a chart of the daily premium in the Baker Hughes(BHI) for BJ Services(BJS) deal. Initially it was nearly 3%, but as we get closer to the anticipated closing of the deal, the discount has narrowed. Now, one can put this trade on to capture 1.1%. With upside of 1.1% and downside of MUCH more if the deal fell apart, I'm of the opinion that this is akin to scooping up nickels in front of a bulldozer, but many people look at it as "well 1.1% in 30 days until the deal closes, that's pretty nice on an annualized basis." Finally, to my point. The IQ Merger Arbitrage fund DOES NOT IN ANY WAY EMPLOY MERGER ARBITRAGE AS A STRATEGY. A look at the fund's top 10 holdings demonstrates that this is not a merger arbitrage fund, but rather a "merger speculation fund." The biggest holding is Starent Networks, which is being acquired by Cisco in an all-cash deal. You cannot hedge away the market risk here by shorting Cisco. WORSE, is the laziness of the fund's attempt at the BJ Services deal I mentioned above. They do not short the acquirer Baker Hughes (even though this is a mostly-stock deal), but instead employ a "market hedge," and that's the biggest flaw in this fund. Instead of putting on trades to capture merger arbitrage, they're simply buying stocks in announced or speculated deals, and shorting the broad market as a "hedge." Even more startling is the fund's own example in its marketing materials, in which they cite the appreciation in shares of Petro-Canada (PCZ), which was acquired by Suncor Energy(SU) . They point out the big rise in PCZ shares, without mentioning their (assumed) market short position, which would have risen along with PCZ, offsetting most gains. 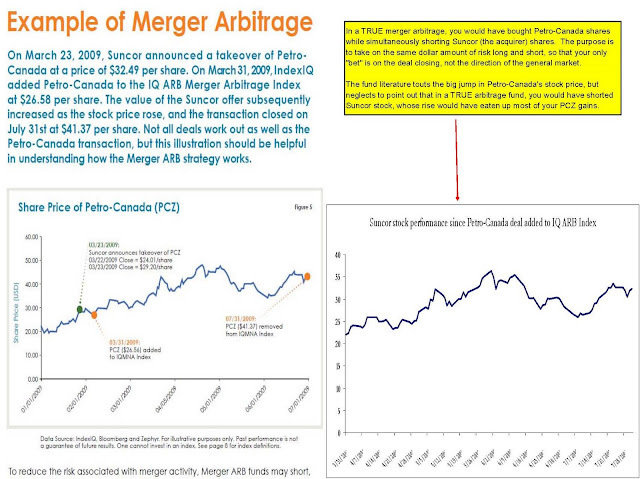 A proper merger arbitrage in this all-stock deal (1.28 Suncor shares for each PCZ share) would have involved shorting SU shares. As both PCZ and SU shares rose, the gains in PCZ were largely offset by losses on the SU short. But that's the point of merger arbitrage. You're not betting on the overall market direction, but rather the deal eventually closing. You'd still have made about 10% on this properly-constructed trade, while hedging away market direction risk. The way this fund is set up, you're buying the target shares at post-announcement highs, while shorting the general market as your "hedge." If the stock market were to rise 40% in the next few months, you would get CRUSHED owning this fund. Why? Because your largest holding, Starent Networks, is being offered $35 per share by Cisco. If the S&P 500 rises 40%, your big market short position will lose a LOT of money (maybe 8-9% hit to the fund based on the disclosed S&P and MSCI short positions), while that $35 offer for Starent goes nowhere. Same with Cadbury at 6% of the fund. Its shares jumped big time as various potential suitors prepare bids for the company, but gains are largely now built into the stock price. The market could jump 40% (which would cost the fund heavily on its short position) but Cadbury likely would not follow. This fund explains its strategies well enough, but the name itself is what will be problematic. Retail investors will hear slick pitches for this fund form their financial advisers or the idiots on TV, suggesting it as a way to copycat advanced hedge fund strategies. Unfortunately, the fund does not employ the technique suggested by its name.